In the second of a series of blogs about residents’ experiences of Big Local, Jeremy Yung looks at how residents and non-residents have distinctive roles in Big Local, and considers whether this helps or hinders the resident-led approach. Click to read Jeremy’s first blog. The Big Local programme aims to put residents in control of making their area a better place to live. One way it does this is through Big Local partnerships. Partnerships are groups of at least eight people, who together are responsible for guiding the overall direction of Big Local in their Big Local area. We require that over half of the partnership members will be people who live within the Big Local area’s boundaries - i.e. ‘residents’. Almost all Big Local partnerships far exceed this 51% minimum. Overall, two-thirds of all partnership members are residents and one-third are non-residents. 140 of the 150 Big Local partnerships have at least one non-resident member, with some having as many as 13. 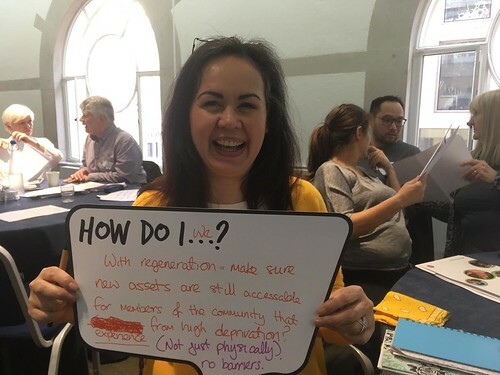 In this blog I’ll look at who these resident and non-resident partnership members are, and what this tells us about Big Local’s resident-led approach. Most residents are on Big Local partnerships simply in their capacity as volunteer residents (85%). If they cannot be classified simply as a resident member, it is because they are likely to be the chair (9%) – which is also a volunteer role. By contrast, looking at the roles of non-residents, some are volunteers but most are there in a paid capacity: either as a worker employed by the Big Local partnership, or as an employee of an organisation or as a representative of local governing body. They could also be employed by the locally trusted organisation. We encourage partnerships to make links with many different individuals, groups and organisations in their area. This could include voluntary organisations, community groups and social enterprises, councillors and MPs, public bodies and businesses operating in or near their area. These links can help to identify opportunities for funding, expertise, joint working and/or support that can benefit the local area. In at least 130 Big Local areas, this means having a representative of one or more of these organisations as part of the partnership. With many non-resident partnership members there in a paid capacity it is no surprise to see that they are also generally of working age and therefore slightly younger than resident members. Almost a third (32%) of residents are 65 and over compared to just 14% for non-residents. Both residents and non-residents have a higher proportion of people with a qualification above A-level than the national average of 38%. However, a much larger proportion of non-residents have a qualification above A-level with 4 out 5 having one compared to just over half of residents. While non-residents are generally younger and with a higher education qualification, it is residents who spend more time on Big Local. 38% of residents spend more than five hours a week on Big Local compared to 18% of non-residents. More than a quarter (26%) of non-residents spend zero hours a week on Big Local compared to just 4% of residents. This is probably because non-residents participate on partnerships as part of their job whereas most residents are there as volunteers, giving their time for free. Almost three-quarters of residents say they are doing things they haven’t done before, compared to just over half of non-residents. This gap could be due to several reasons including that, as representatives of partner organisations, local authorities or the locally trusted organisation, non-residents are likely to have an advisory role or helping to deliver aspects of the Big Local plan that they specialise in. Residents are likely have more to do with activities and decision-making on things that they may not have previous experience in. What does this tell us about Big Local’s resident-led approach? Residents have a clearer role as representatives of their community. As they are almost always volunteers, they commit more of their own time and get more learning from their experiences. Non-residents have multiple roles but a large portion are either Big Local workers or representatives of local organisations and bodies that play a part in the delivery of Big Local. Therefore, non-residents have influence by providing expert guidance, skills, links and resources. In the case of workers, they also oversee the day-to-day delivery of Big Local activities. Does this affect the extent to which Big Local is ‘resident-led’? Also, as Big Local areas progress on the Big Local journey how does the understanding of ‘resident-led’ change? One London Big Local partnership that is already well into spending their £1 million recently took a step back and reviewed their partnership and what it means to be resident-led. They found that residents had gained in confidence and experience since the start of Big Local, and so they felt more able to take on greater responsibility, oversight and implementation. The partnership, including non-residents, agreed changes to their decision-making processes and oversight that would help to put residents even more in the lead. ‘Resident-led’ is not simply about the number of residents on partnerships; it is a value and ethos of Big Local that we want all participants to embrace, whether a resident or non-resident. It is also something that partnerships have to continually work at and reflect upon throughout the Big Local journey. What about your Big Local area? What does resident-led mean to you? How do you ensure residents remain in control? Drop us an email or contact us on Facebook or Twitter using #BigLocal. Look out for more blogs from Jeremy this month, all about Big Local residents’ experiences. Click to read Jeremy’s first, third, fourth and fifth blog in the series.